Second Lt. Ryan Novack, the 36th Munitions Squadron flight leader, prepares to run March 1, 2017, at Andersen Air Force Base, Guam. 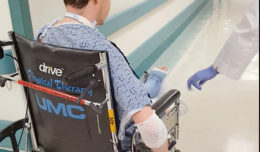 Novak was a victim of a serious spinal injury from riding dirt bikes, resulting in him being paralyzed below the knees. After attending months of physical therapy, Novack returned to work and is currently conditioning for the Defense Department Warrior Games this summer in Chicago. These were the words spoken by an Airman who would soon experience and overcome a road filled with pain, courage and resilience. After a long day of work, Novack made plans to ride his dirt bike to decompress. After gearing up, it was only a matter of minutes before his life would be changed forever. As Novak began riding the course, he increased his speed not aware of the curve that was up ahead. As he approached the bend in the track, he realized he could not slow down fast enough. At this moment, he figured he would hang onto the bike and make a smooth landing and get back on track. However, his plan failed. As he hit the turn, he soared through the air with his bike and came crashing down on the hot pavement. During those seconds in the air, his immediate thought was he would be alright. Upon coming in contact with the ground, Novack’s wingman, Master Sgt. Jeffery Maume, came rushing to his side to assess the situation. When someone has a physically traumatic injury, it’s recommended to not move until you receive medical attention from professionals to avoid spinal or further injury. Novack however, did not realize the extent of his injury and attempted to stand up to walk it off. After attempting to get up, Novack realized he could not feel his legs. His wingman advised that he lay there while he called for help. In a matter of minutes, Novack was loaded onto a stretcher and sent to the U.S. Naval Hospital Guam. “Even in the ambulance, I was still sure that this wasn’t anything more than a small injury,” he said. Upon arriving at the hospital and receiving CT scans, Novack was found to have a broken back, spinal compression and a shattered T12 vertebrae. He was then transferred to Guam Regional Memorial Hospital where he would receive further care before being medically evacuated to Hawaii for treatment. Novack had his first sense of feeling in his lower extremities with a twitch in his big toe while in intensive care. After spending three weeks in Hawaii, Novack was able to get the feeling in his right leg back. Just as things were going well, the doctors found something that would change his life forever. The news was devastating. Thoughts that he would have to leave the military crossed his mind and although everything that could go wrong, went wrong, he still remained faithful that everything would work out in the end. Fortunately for Novack, his family was at his side through it all. “I had my mother with me, so I wasn’t alone. I’m thankful for that,” Novack said. For the remainder of his recovery in Hawaii, Novack still did not have any feeling in his left leg. When the option for him to be medically discharged out of the military came up, he put his foot down and made it clear that he did not want to leave and that he would overcome his injury and come back stronger than ever. Once again, Novack remained faithful and received the news that he was well enough to leave and would be attending rehabilitation in Chicago where he would be near family members. There, he would spend six months in intensive rehab, regaining his strength and preparing to return to work. After completing physical therapy and getting some feeling back in both legs, Novack made an astounding recovery and made his way back to Andersen AFB to get to work. Although he was on crutches and had braces on both legs, he reported to his workplace in good spirits. He overcame his injury and remained resilient. 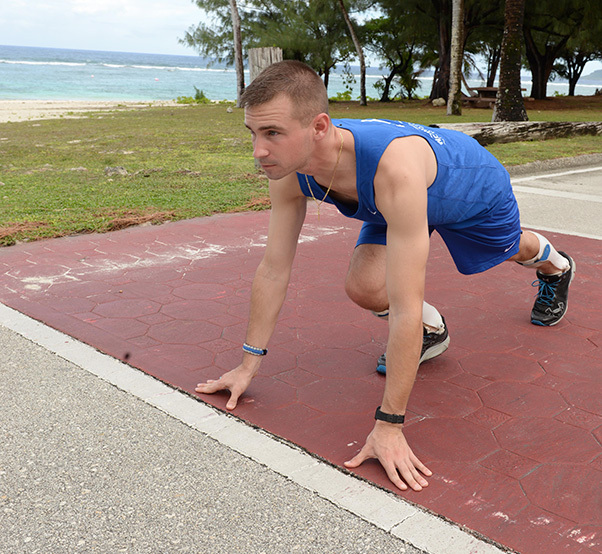 Novack recently ran his first mile since the injury and is determined to continue to run so he can achieve an “excellent” score on his official physical training test. This summer, Novack will be competing in the 2017 Defense Department Warrior Games in Chicago where he will be competing in the rifle, pistol, wheelchair basketball, wheelchair racing and swimming events.